Toluca (population 1,339) is located in north central Illinois in east central Marshall County. The town is located on Illinois Route 117 just south of Illinois Route 17. The AT & SF Railroad runs through town as does the North Branch of the Crow Creek. The town is located about 30 miles northeast of Peoria (as the crow flies). According to the web sites http://www.piperspages.com/Marshall/toluca.html as well as http://www.piperspages.com/Marshall/TolucaNow.html, the Santa Fe Railroad became the driving force behind the location of Toluca. The railroad began coming through the area in 1887 and the coal mines were established in the area in 1892. Soon the town of Toluca was "booming," becoming incorporated in 1893. By 1907, Toluca's population had swelled to over 6,000 residents! The town continued to flourish until 1924, when the coal mines closed. In that one year hundreds of families left town looking for work. Though two hills, known as "The Jumbos," in Toluca remain as reminders of the town's coal mining past, the population has declined to a steady 1,400 for the past few decades. St. Ann's Church was created in the very early 1900s to serve the Irish Catholic familes in the Toluca area. The first catholic high school in Toluca was St. Joachim. This school was created in 1901 and included grades 1 - 8 and a high school curriculum of at least two years, possibly even four years. There may also have been a "convent school" established around this time. There is one article quoted below which speaks of the gradauation of two girls from the tenth grade of the convent school. In 1906 the high school portion of St. Joachim was closed, according to a newspaper article that appeared in the Toluca Star Newspaper. However there is later a copy of the graduation anonouncement for St. Joachim's High School dated for 1915. It is at this time (1906), or shortly after, that we believe St. Ann's High School was begun. 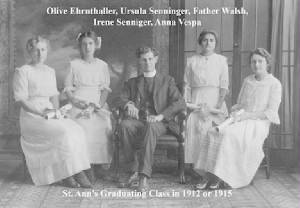 We know from a St. Ann's photo, that graduating classes were an annual occurrence from around 1912 and beyond. We know for a fact that St. Joachim's parish was closed in 1921 and joined with the St. Ann's parish. We also know that the high school portion of St. Ann's school closed in 1928. 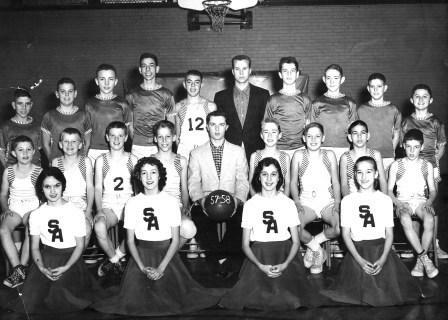 St. Ann's High School became a co-educational facility and participated in athletic contests with other parochial schools of the area. "Father Boncini was called to establish the St. Joachim's School in 1900. In the summer of 1922 the school was moved in 2 parts from West Santa Fe Avenue to the present location at 121 North Chestnut. The high school was discontinued in the year of 1928. The children were taught by the Sisters of Saint Francis whose Mother House is located in Clinton, Iowa." Terri Taylor provided several pieces of newpaper articles regarding the catholic schools of Toluca in the early 1900s. Those articles are available below. If you have any other information to assist in this research, please contact us at eganann@sbcglobal.net . "I am gathering information to send to “Women and Spirit: Catholic Sisters in America” traveling exhibit. (In Dubuque in 2011). I came across your website that asks for info on St. Ann’s in Toluca. It states, “The children were taught by the Sisters of Saint Francis whose Motherhouse is located in Clinton, Iowa.” That is correct, those are the sisters for whom I work. I thought you might like to know what I found on Toluca in our archives here. We show money/paychecks being received from the school as early as 1906, but 1906 is when the bookkeeping book began. (The book prior to that is lost or never existed, times were hard then.) Another note goes back farther, one on staffing shows the Sisters of St. Francis working at St. Ann’s in Toluca from 1901-1973. Another paragraph written in 1991 says St. Ann’s in Toluca was opened in 1901. It was built and supported by a wealthy mine owner. The townspeople were Italian mostly, who worked in the coal mines. There was a mixture of Irish who worked on the railroad and some Mexican migrants. After the mine owner died, the school had financial problems but stayed open until 1971, the mines were closed then, and the railroad wasn’t employing too many." We know for a fact that St. Ann's High School competed with other schools in the sport of basketball. They even competed in a gym known as the "Toluca Coliseum". We do need information on seasonal records, coach's names, uniform colors, nickname, and fight song. Other sports such as baseball and track may also have been offered. "February 12, 1926 - St. Ann ’s – St. Bede’s – The St. Ann’s High School basket ball team will play St. Bede Academy in the Toluca Coliseum, Friday evening, Feb. 12. They lost to St. Bede in a previous game, but the teams seemed to be about evenly matched and the Toluca game will probably be a close one. The following Tuesday, Feb. 16, the St. Ann’s team will play the famous Spaulding Institute team which won the National Catholic championship two years ago. The Toluca team does not expect to win but their defense in Peoria won the admiration of the crowd. Those who wish to see some flashy basket ball should see this game. Arrangements are also being made for two games with St. Paul ’s of Odell." Plays, musicals, and many other activities were likely offered to the students of St. Ann High School. Please check out reports of some of these activities below. 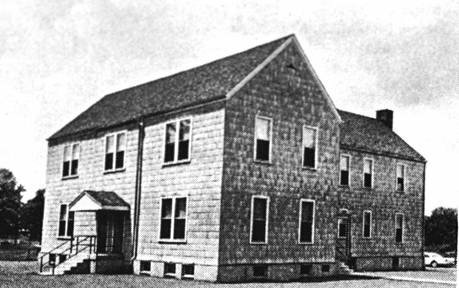 Father Boncini was called to establish the St. Joachim’s School in 1900. ----- In 1900, - Fr. Bonocini came to Toluca to establish a parish for the Italians. The first buildings were built by Charles Devlin, a coal mine operator in Spring Valley and Toluca . The school building was two stories with four rooms for pupils and apartments for nuns. He also built a combination frame Church and parish house, seating capacity 250. The priests who served the parish came from a missionary organization of Italian priests located in St. Louis . The generosity of Charles Devlin enabled this parish to exist, and after his death, the Church could no longer expect help from this source. January 15, 1904 - Toluca has three schools – the public school, the Sister’s school and the school of crime. The public school is supported by the taxpayers of this district, and the school board has levied a tax ($11,500) eleven thousand and five hundreds to run it the coming year. The Sister’s school is supported by voluntary contributions. The school of crime is on the streets and in the alleys and holds its most important sessions at night, where the lessons learned are cigarette smoking, foul language and obscenity. Parents, which of these schools does your boy attend? Do you doubt that this school has a good attendance in Toluca ? If you do, you only have to use your eyes. You may find your boy in one of the classes of the school of crime. March 8, 1907 - The news of the death of Dr. Bononcini at the early hour Saturday morning, March 2, was a great shock to his friends here. While he had not been in good health for several weeks, he was able to be around and to attend to his duties as pastor. Heart failure was evidently the cause of death. In 1900 Bishop Spalding of Peoria , recognizing the need of an Italian priest for the growing Italian colony in Toluca, asked the bishop in Kansas for a good Italian priest, and Dr. Bononcini came. He had a church erected here, and a year later founded the convent and established the Sister’s school. During his administration the convent schools were free, and all grades were taught from the primary to the high school, and the high school after the first year was second to none in Marshall County . June 21, 1907 -v Convent School – Commencement Exercises – Six Graduates – The commencement exercises of the Toluca convent school were held at the opera house Monday evening. Six girls graduated – two in the tenth grade and four in the eighth. The graduates in the tenth were: Gertrude Proctor and Minnie Gerth. Those in the eight were: Annie Wargo, Margaret O’Brien Teresa Farley and Kathleen Breen. The attendance was large, in fact the house was packed. June 24, 1910 - A grand entertainment was given at Jensen’s theatre on the evening of June 16th, by the children of St. Joachim’s school. June 2, 1916 - Class Banquet – The evening of Wednesday, May 24, was one of gay festivities for the graduates of St. Joachim’s School. At 5:30 o’clock, arrayed in evening attire they assembled in the parlors of the Sister’s home which were artistically decorated in the class colors, while ferns and flowers made a fitting background for the happy faces. At six-thirty they were ushered into the dining room where they enjoyed a five course banquet served by the little Misses May Schwartz and Doris Durham, who proved themselves skilled waitresses. In the summer of 1922 the school was moved in 2 parts from West Santa Fe Avenue to the present location at 121 North Chestnut. At the request of St. Joachim’s Bishop Dunne, the supervision of the school was turned over to Fr. Phillip Walsh, pastor of St. Ann ’s Church at that time. - The congregation of St. Joachim’s continued to meet under the leadership of the pastors until 1921, when it united with St. Ann's Parish. 1928 - The music room at St. Ann ’s School was decorated in the appropriate red and white colors of Valentine Day and with the guests as vivacious as ever, it is no wonder that the Valentine Party sponsored by the St. Ann ’s High School Girls was voted a huge success. The high school was discontinued in the year of 1928. The children were taught by the Sisters of Saint Francis whose Mother House is located in Clinton, Iowa. St. Joachim’s Church was also moved and located just north of St. Ann ’s Hall (Hall was constructed in 1936) and was used as a gymnasium. This later burned down. The Sisters of St. Francis who’s Mother House is located at Clinton , Iowa , taught in the grade school for many years. Pastors - In 1936, a new parish hall was completed under the supervision of Fr. Francis J. Casey. Much of the work of building this hall was done by the parishioners during the depression. This building was used not only as a parish hall, but as a gymnasium. - Father Boncini was called to establish the St. Joachim’s School in 1900. In the summer of 1922, the school was moved in two parts from West Santa Fe Avenue to the location at 121 North Chestnut. St. Joachim’s Church was also moved and located just north of St. Ann ’s Hall (Hall constructed in 1936) and was used as a gymnasium. This later burned down - The Sisters of St. Francis whose Mother House is located at Clinton , Iowa , taught in the grade school for many years. Father Roche rebuilt the school in 1950 for $30,000. Franciscan Sisters are teachers. 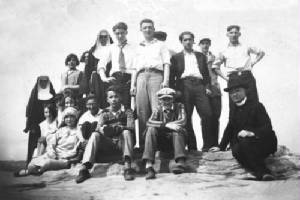 Father Patrick Convery, I. C., was administrator for a few months after Father Roche’s death in 1954, until Father John Schumacher was appointed in May of that year. The church was remodeled in 1954. Father T. J. Lesniak was appointed June 2, 1970. St. Ann ’s Grade School closed in 1971. The Toluca Schools leased the school to the Toluca School District for several years because of the need for more classrooms. The C.C.D. (Children’s Religious Education) programs and the Adult Education Programs were coordinated by nuns in the early years, after the closing of St. Ann ’s School, and later these programs were coordinated by members of the parish.